Japan’s Olympic champion Naoko Takahashi has flatly denied that she was helped by aperformance-enhancing substance when she set the world’s best marathon time in Berlin. “If you see me train for a week, you may understand that I am able to produce a record of this kind,” said the 29-year-old runner. Takahashi also revealed that injury fears had forced her to abandon plans to record back-to-back marathon wins by running in Chicago on Sunday. “While I focused on my speed in Berlin, I had aimed to test the limit of my physical strength in Chicago,” she said. 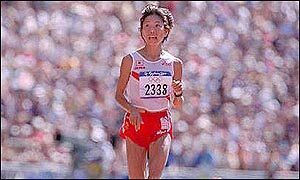 Takahashi clocked 2hr 19min 46sec in the Berlin marathon in ideal overcast conditions, becoming the first woman in history to go under the magical 2hrs 20mins barrier. Her record was broken in Chicago by Kenya’s Catherine Ndereba, who set a new mark of 2:18.47. Most Japanese media have ignored the doping allegations, but some tabloids raised a furore over a report in an American newspaper that claimed her performance was chemically enhanced. The New York Times said her unprecedented speed and “curious eating habits” would “undoubtedly raise suspicions”. 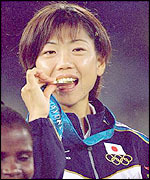 The report pointed to Takahashi’s year-old comment that her success at the Sydney Olympics was partly due to drinking the stomach secretions of larval grubs of giant killer hornets. The drink in question is a commercially-sold Japanese fitness beverage, allegedlyderived from 17 kinds of amino acid to promote the burning of body fat. Takahashi endorses the drink in a television commercial.